The information below was shared by unhappy state workers and teachers who are mobilizing against having their State Health benefits drastically reduced. There are also two attachments, one specifically for teachers and one for all State Health Benefit Workers, with this post that can be shared with others to inform as many affected people as possible. Please share with as many people as possible. New Jersey has made major changes to the health insurance that police, paid firemen and municipal workers have through the State Health Benefits Plan (SHBP), and those very same drastic cuts could be happening to you very soon if New Jersey teachers do not speak up. In July 2015, the SHBP Plan Design Committee, which covers many police and fire employees, among others, voted to reduce the coverage of a number of important medications, dramatically cut the payment for chiropractic care and acupuncture, as well as increase deductible and co-pays for hospitalization. Members of these unions are furious about these reductions and have been fighting back ever since. Lawsuits are already in the courts. Teachers with SEHBP benefits have complained throughout the state that they do not want these same drastic cutbacks in insurance coverage to occur and are working with the NJEA to try and stop the state from cutting their benefits. On Aug. 29, 2016, the SHBP Plan Design Committee voted to make even further dramatic changes to State workers health benefits, and we anticipate in the very near future, the same will happen to teacher’s benefits. The new resolutions will now cut the reimbursement for physical therapy services, pharmaceutical coverages and reduce Medicare services by offering Medicare Advantage plans. These plans have limited coverage for many. We must all fight back before these changes are forced upon us! force limited benefits for teachers. We cannot allow this to occur, or it will continue to occur! • Call the Governor’s Office at 609-292-6000 and tell him to fill the vacant seat on the SEHBP Commission. He has the names NJEA gave him – now fill the seat! • Stand with and support the other professions that Gov. Christie is cutting benefits for to show solidarity. 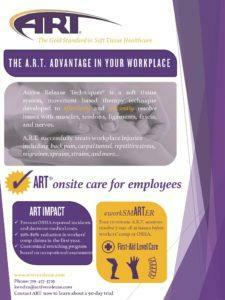 Dr. Aaron was recently certified to participate in the Active Release Techniques (ART) Elite Provider Network (EPN), which is an amazing opportunity to help employees feel better and companies save money on workers compensation claims. Active Release Techniques (A.R.T.) is a soft tissue system, movement based therapy technique developed to effectively and efficiently resolve issues with muscle, tendons, ligaments, fascia, and nerves. FREE ADVICE: Do Not Make New Year’s Resolutions! Forbes released and article in 2013 stating that only 8% of people keep their New Year’s Resolutions (NYR). This information, along with 36 years of experience, is enough to make me think that NYRs are pointless and can be detrimental to your health. Personally, when I have set a NYR in the past, and ultimately failed, a little piece of me died due to the negative self talk that accompanied the failure. Not succeeding in a NYR can create negative mental, physical, and social health. I recently took at 10 week leadership course with Arnie Rintzler, of AWR Business Concepts, that covered many personal and professional topics. It was an absolutely amazing experience that I would recommend to anybody looking to be more successful in any aspect of life. I want to briefly talk about one of the major topics, GOALS (read as a soccer announcer would say it…GGOOOAAALLLLLL…you know you did it that way in your head…). We set mini goals all the time, like wake up at 5:30, put on clothes before leaving the house, arrive safely to work, and most of these do not need extra thought, but new/bigger goals do. I have done many things with goals and goal setting throughout my life, through Arnie’s teaching I duscovered a few important steps I’ve done unconsciously in goals I’ve succeeded in and not in goals I didn’t achieve. Listed below are the steps that work for me. The bold points are things I’ve recently discovered need to be accomplished for greater success in reaching goals. Set the specific goal, it must have a target date, and put it in writing! Write down what the rewards are for achieving the goal and also the consequences of not achieving the goal! Create affirmation specific to the goal and read them daily! Create a list of possible objections, things that may stop you from reaching your goal, solutions to consider, action steps to take, a date to overcome/surpass the obstacle. This is like a goal within the goal and help break things into BABY STEPS (thanks What About Bob). There you have it, give these simple extra steps a try and start crushing your goals and becoming a better you!!! Many of us do not make time for doing things that would benefit us. A couple examples of this are: blogging and regular chiropractic adjustments. Keep reading to find out what these 2 things have in common. I have been told many times by Bill Treloar, the owner of Rank Magic, that I should blog monthly, at a minimum, to share my thoughts, ideas, and education with others because it’ll reach far more people than I can on a daily basis while traveling to my patients. The internet is amazing for being able to help contribute positive thoughts and information to the masses, which I can use to help me reach a life goal of helping as many people as possible. By blogging regularly I will be able to reach exponentially more people than I currently do, based on this, I will now be putting up regular posts in order to share what I have learned, and continue to learn, about health and wellness. If you want more education about websites and SEO, please take a look at all the great info over at http://www.rankmagic.com/blog/. Regular Chiropractic care has similar results and can achieve the goal of HEALTH. By getting your spine checked regularly, you increase your chances of getting and staying healthy. Chiropractic care has been reported to relive back pain, neck pain, stiffness, headaches, leg pain, numbness or pain in the hands, arms or legs, allergies, digestive disorders, sinus problems, cramps, and other common issues. When utilized regularly, you can increase your chances of increased health and wellness and the best communication between your brain and body. Just like with blogging, I’d also recommend monthly spinal check-ups. Give Dr. Aaron a call at (973) 934-1787 for your FREE Consultation and Insurance verification. It’s that time of year again for Karen (my fiance until 10/12/2014 at which point she will be my wife) and I, we will be traveling North a few hours for her annual family reunion. It’s hard to think about family and loved ones without Sister Slegde’s ‘We Are Family’ (YouTube video included) playing in my head, on repeat! …and…SHARE THIS WITH EVERYONE YOU KNOW!!! Thanks and always remember to not take people for granted. I was Certifiable, but now I’m Certified!!! I’m super proud and excited for the Rocktape Facial Movement Taping I and II certification I received last month! This tape is amazing and so are the uses and results from it! Dr. Pazik participated in the Rocktape FMT I & II Certification June 21-22 and is not fully certified in Fascial Movement Taping. Check out the new page on our website: peakspinalcare.com/rocktape for more information. Nothing in the universe is static. Everything moves. Everything is dynamic. The human body is no exception. Movement is key to all healing regardless if your patient is pregnant or suffering from a car crash. It’s time for change. A revolutionary change. FMT lays out the argument of why we’ve been doing it wrong for 100 years. It presents new ways of thinking about acute and chronic care. It integrates the best treatments with kinesiology taping to deliver the best possible patient outcomes. Over the past week I had the pleasure of traveling to Orlando, Florida for a few days in order to check on things for my upcoming wedding with the love of my life, Karen. We stayed at Walt Disney World and it was awesome, as it always is. It gave me a chance to partake in one of my favorite pastimes, PEOPLE WATCHING! As a Chiropractic Physician I find the human body to be an amazing thing to watch, what’s even more amazing is the amount of damage we can do to our bodies and they keep on going. Everywhere I go there are an exorbitant number of overweight/obese/morbidly obese people walking/rolling around, and this number seems to increase exponentially in amusement parks. This great nation is creating a health gap, much like the increasing gap between lower and upper class. I am beginning to see that most people fall into one of two categories, morbidly obese or extremely fit. I found it amazing to watch all the different people, from different countries, come together to have a great time at Disney, but found it very sad to see the microcosm of unhealthiness of the human species, very sad. I am hopeful we can turn it around in the near future, but that’ll only happen if a majority of people take their health and nutrition into their own hands and stop listening to the conglomerates who get rich off selling junk food. The moral of the story: People watching is always educational and the supposed Healthcare (aka Sickcare) system in the USA is BROKEN!!! If you aren’t getting your spine checked, by a licensed Chiropractic Physician, on a regular basis then you are cheating yourself of optimal health and wellness. You (hopefully) don’t wait until you have a toothache to get your teeth cleaned, so don’t wait until you have a backache to get your spine checked.